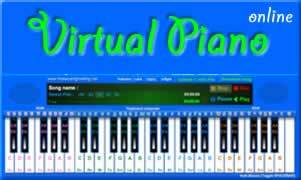 The piano is a musical instrument played by means of a keyboard. Widely used in classical music for solo performances, the piano is also very popular as an aid to composing and rehearsal. Pressing a key on the piano's keyboard causes a felt-covered hammer to strike steel strings. The hammers rebound, allowing the strings to continue vibrating at their resonant frequency. These vibrations are transmitted through a bridge to a sounding board that more efficiently couples the acoustic energy to the air. The sound would otherwise be no louder than that directly produced by the strings. When the key is released, a damper stops the string's vibration. 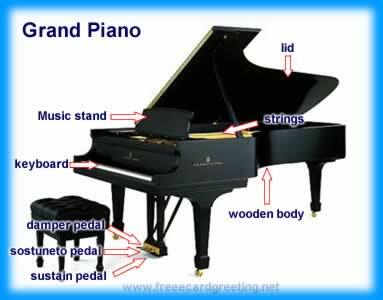 In grand pianos, the frame and strings are horizontal, with the strings extending away from the keyboard. The action lies beneath the strings, and uses gravity as its means of return to a state of rest. Upright pianos, also called vertical pianos, are more compact because the frame and strings are vertical. Upright pianos with unusually tall frames and long strings are sometimes called upright grand pianos.